A U.S. Postal Service program to open "mini post offices" inside dozens of Staples stores has drawn a sharp rebuke from postal employee unions. Workers are concerned the experimental locations -- staffed by Staples (SPLS) employees, not Postal Service employees -- will lead to the closure of traditional post offices and the loss of jobs with good wages and benefits. "The Staples-USPS deal has to be looked at in the context of a drive towards privatizing the U.S. Postal Service," said Mark Dimondstein, president of the American Postal Workers Union. His group is a network of local unions that represents over 220,000 current and retired mail workers. "We are willing to support this program as long as it's staffed with United States Postal Service employees," he said. Staples declined to comment on the unions' concerns and said it doesn't discuss agreements with vendors, but said the pilot program is intended to offer "added convenience for our customers." "Staples continually tests new products and services to better meet the needs of our customers," said spokeswoman Carrie McElwee. And Postal Service spokeswoman Darleen Reid-MeMeo rejected the idea that the Staples program was "an attempt to replace stand alone Post Offices." The post office, whose financial struggles are well-known, is adapting, Reid-MeMeo said. The Staples pilot is the next step of a program that already has over 65,000 retail partners -- including grocery stores and pharmacies that sell stamps and village stores that sell flat-rate boxes in rural areas. Sarah Ryan, a faculty member at The Evergreen State College in Washington, said she thinks the Staples partnership does little to help traditionally underserved postal customers. "The interesting thing is this won't do anything to help people who are in rural or lower income neighborhoods," Ryan said. She has studied privatization and the Postal Service and is a former retail clerk at a Seattle post office and held elected positions in the local postal union. Related: Can package delivery save the Postal Service? "This is the first time since the Sears deal that there's an effort to move the retail into a national, corporate chain," she said. In the 1980s, the Postal Service and Sears (SHLD) struck an arrangement similar to the one at Staples today. Postal unions protested and the program was eventually canceled. This time around, Dimondstein said, the union president, said workers want guarantees their jobs will be protected and not outsourced to Staples. "We do not have any problem with the people of this country getting expanded access to postal service," said Dimondstein. "We are willing to support this program as long as it's staffed with United States Postal Service employees." 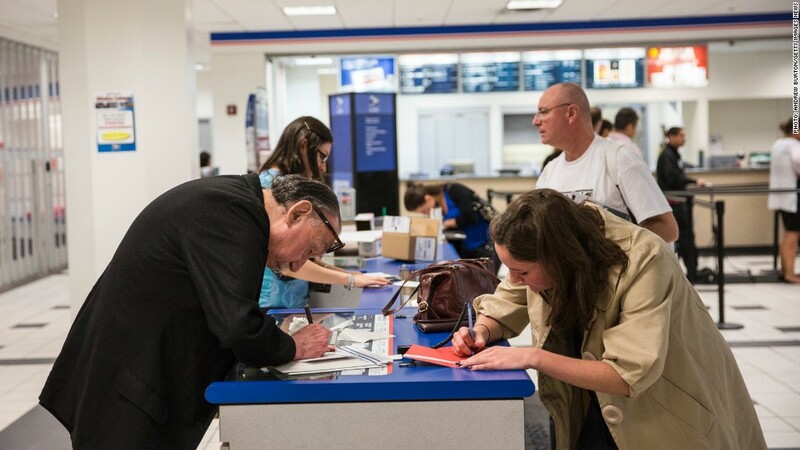 The Postal Service counters are currently available at just over 80 Staples stores in and around San Francisco, San Diego, Atlanta, Pittsburgh and Worcester, Massachusetts, said Reid-MeMeo, the USPS spokeswoman. She said the postal service is "always looking to expand access to postal products and services in locations where our customers frequent."